Crosswalk overhead beacon and signage in Tucson, AZ. Photo: FHWA. 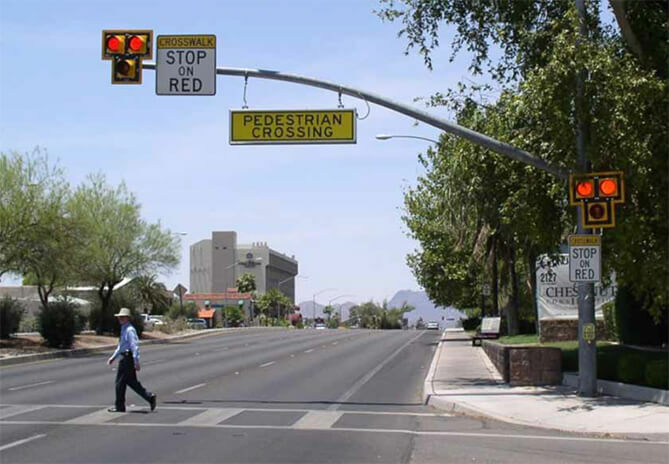 This course provides participants with (1) a basic understanding of intersection safety issues, (2) “how to” information for common safety tasks and low cost safety improvements that do not require an engineered design, and (3) background information on safety tasks that do not require an engineer. This workshop also outlines areas where non-engineers can assist traffic engineers in the safety process, and help them to understand when an engineer needs to be consulted to make a safety related change to an intersection. Intended Audience: Individuals conducting engineering and traffic studies and those responsible for identifying safety problem and potential solution including street superintendents, public works employees, municipal managers, elected officials, and engineers. The course focus is on the non-engineer. This course is not geared towards law enforcement.